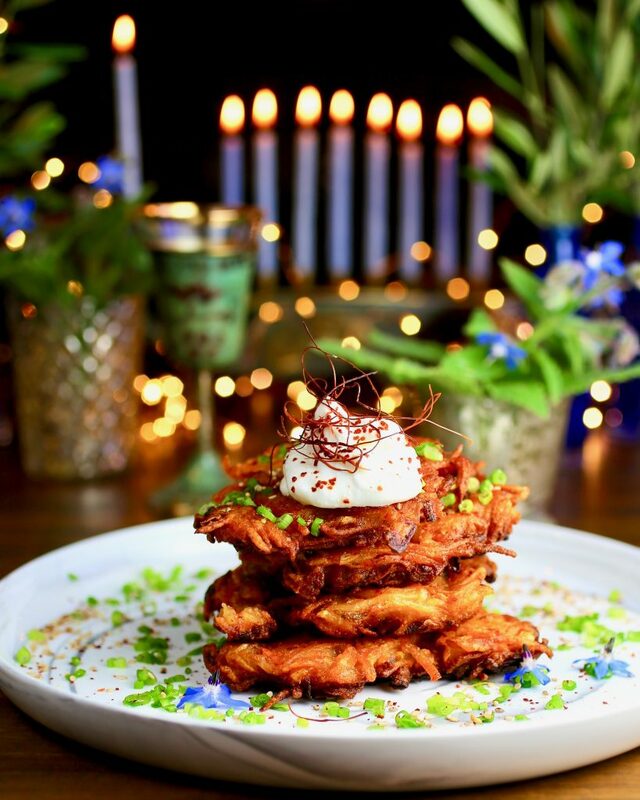 Kimchi Potato Latkes and Happy Hanukkah! A jug of olive oil, which held enough oil to last for one day, burned for eight when the Holy Temple in Jerusalem was rededicated. We eat foods fried in olive oil to commemorate that ancient miracle from the second century BCE and potato pancakes are almost everyone’s favorite symbolic food. This year my latkes have a daring twist. 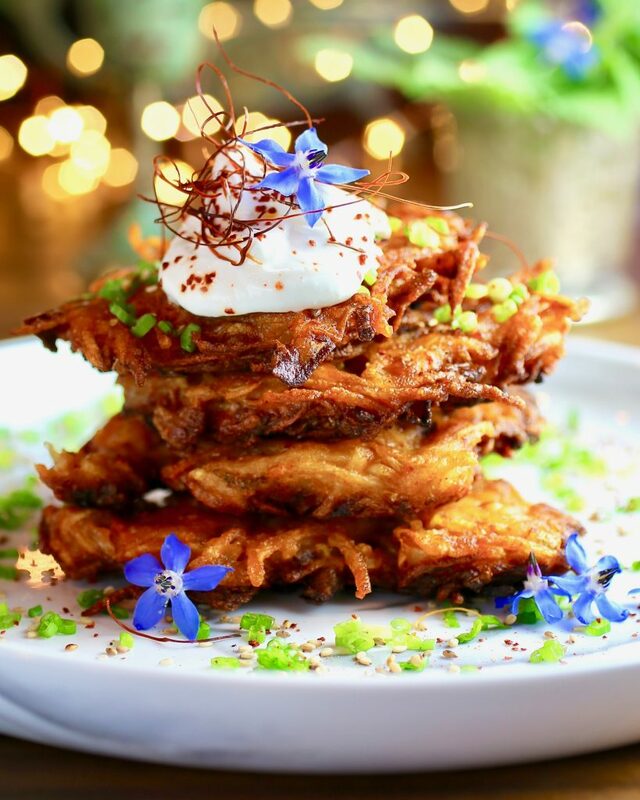 5779 is the year of the Kimchi Potato Latke! Adults who adore kimchi’s complex spicy, salty, sweet, sour, bitter, umami, fermented flavors will fall hard for this pancake. Kids, unfortunately, not so much…the younger set should probably stick to traditional style potato latkes with that wonderful combination of sweet apples and sour cream, like this one. 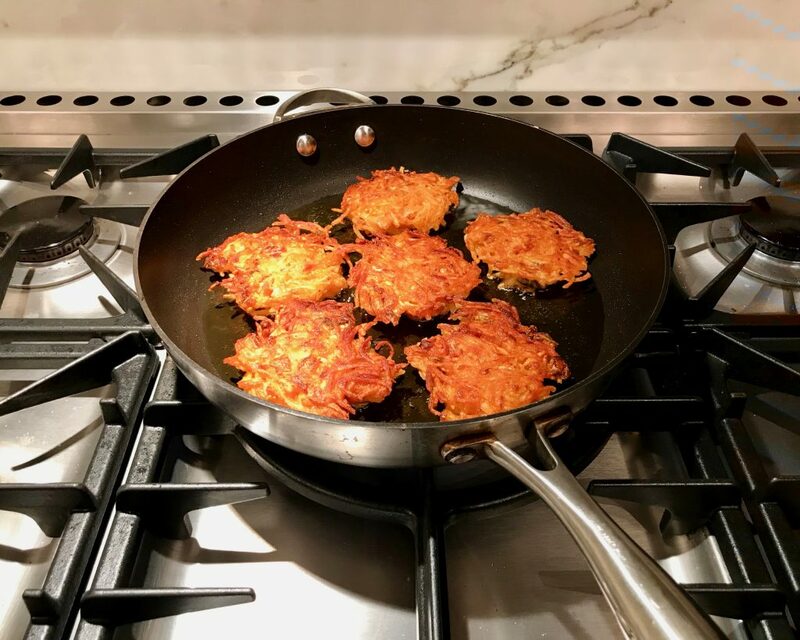 The recipe is a marriage between my kimchi jeon (mind-blowing kimchi pancake batter) and my standard recipe for potato latkes. The combination is amazing pancake synergy. To make the batter, mix all the dry ingredients together in a medium-sized bowl. Whisk in the water. Add kimchi juice and whisk until the batter is completely blended and there are no lumps. 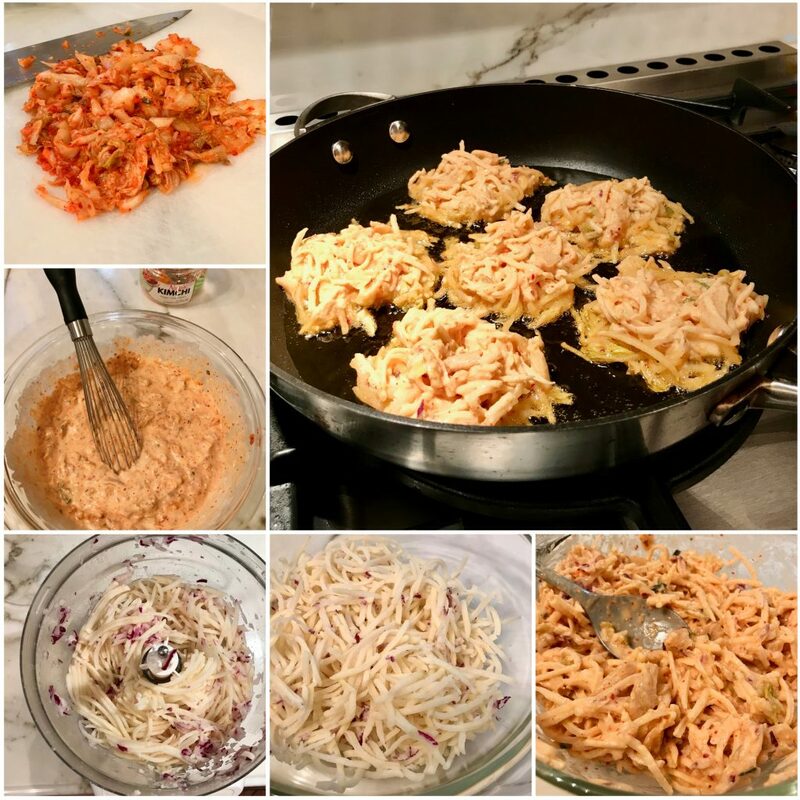 Fold chopped kimchi into the batter. Yield is about three cups. Grate one potato and 1/8 red onion in a food processor. Remove the potato from the food processor one handful at a time. Squeeze out as much moisture as possible by hand. Place each handful in a large bowl. Mix one cup of batter with the squeezed-dry potato onion mixture. The ratio is one cup of batter to one potato to 1/8 red onion. This makes about six latkes. Heat a large sauté pan over high heat. Add 1/2 olive oil 1/2 grapeseed oil mixture to generously cover the bottom of the pan. When oil is hot, add mounds of the potato kimchi mixture. Don’t compact the batter or press down on the latkes (but don’t make them too thick either). Turn the heat to medium-high. When the bottom of each latke is nicely browned, flip and brown the other side. Adjust heat as necessary to get the outside a nice crispy golden brown while giving the interior a chance to cook all the way through (this is important). Drain on paper towels. Serve hot. Garnish with all the above. Sending our warmest wishes to you at Hanukkah. May you be blessed with joy, good health, and peace.